Nancy Allen I like biscuits and I'm always looking for new and easy recipes and so I gathered some from the JAP Archives. Thanks, Nancy! We sure like them! Thanks Bonnie, I love the variety of of biscuits in one book to pull out and make for my family. Your Cat Head Biscuits sound amazing, Thanks! 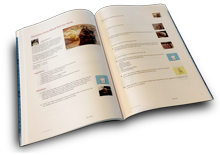 Great collection of recipes! Congrats!